Publication: Arch. Bot. (Leipzig). 1: 40. 1798. 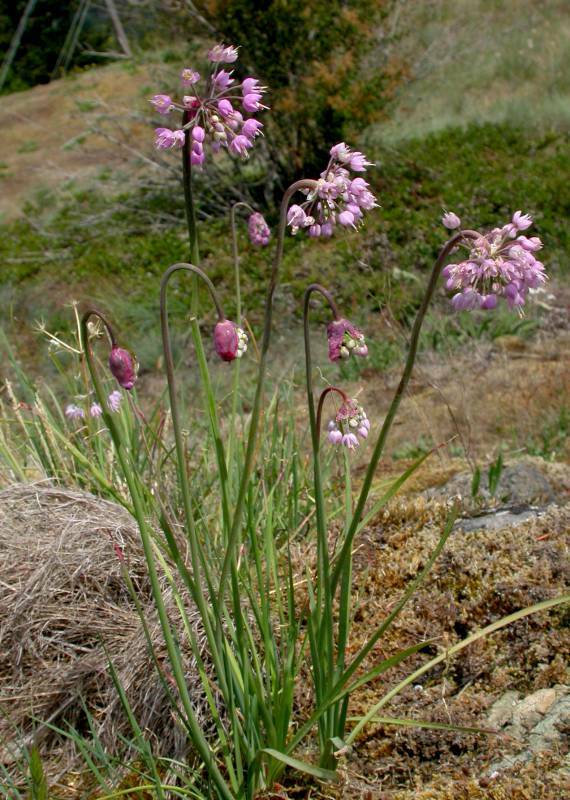 Notes: FNA26"Allium cernuum is the most widespread North American species of the genus. It is closely related to A. stellatum, and the character commonly used to differentiate them has been umbel orientation. In both species, the inflorescence is nodding in bud, but in A. stellatum it usually becomes erect by anthesis. In A. cernuum the peduncle remains permanently recurved near the apex, although the inflorescence may sometimes become erect overall, or nearly so. While this character is helpful in identification, an almost exclusive reliance on it (even by one of the present authors in his youth) has obscured other clearer distinctions between the species and has confused their geographic ranges. More reliable characters for differentiating these species are bulb shape (elongate in A. cernuum, ovoid in A. stellatum) and perianth shape (campanulate in A. cernuum, stellate in A. stellatum). Unfortunately, perianth shape is often difficult to see in herbarium specimens."